There’s the cutest little book by Jane Yolen, one of my favourite authors, called Baby Bear’s Books and one of Little Mister’s favourite parts has to do with “dinners all ending with huge honey cakes.” When I was trying to decide what special treat to make for Imbolc, this line came flying into my mind. 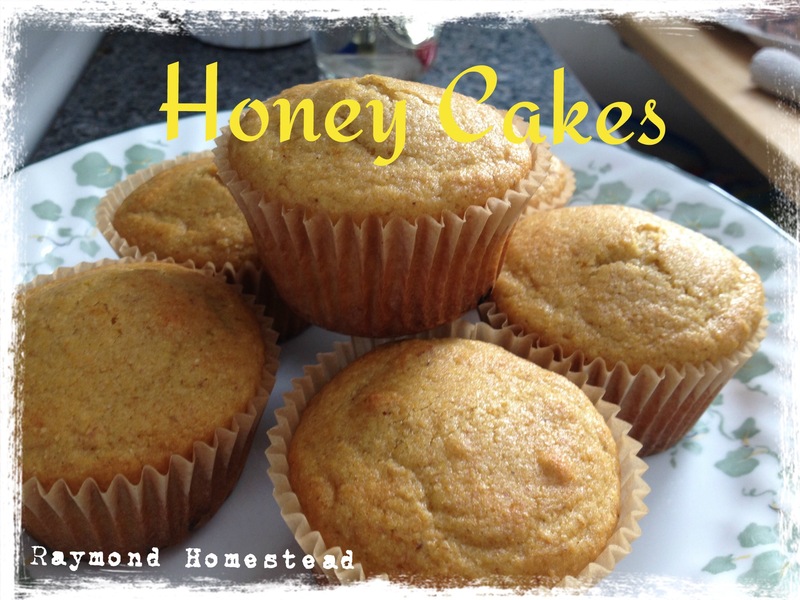 I scouted out a few recipes, but none of them looked to give the cakes that strong yet sweet honey taste I was thinking of. 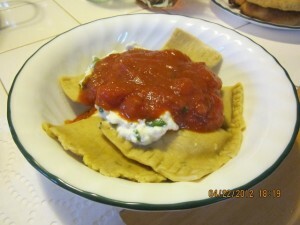 So, without further ado, I give you one of our original Raymond Homestead recipes. Mix all dry ingredients together. In a separate bowl, whisk together all the wet ingredient. (This may take some work, so stretch your arm muscles beforehand!) 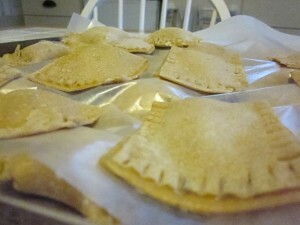 Combine both wet and dry ingredients until just moist. Bake in a lined or greased muffin tin at 350F for 20-25 minutes. My son’s favorite type of egg is hard boiled. Egg salad sandwiches are a staple in this house. Not to mention hard boiled eggs make a great baby toy (with supervision, of course). 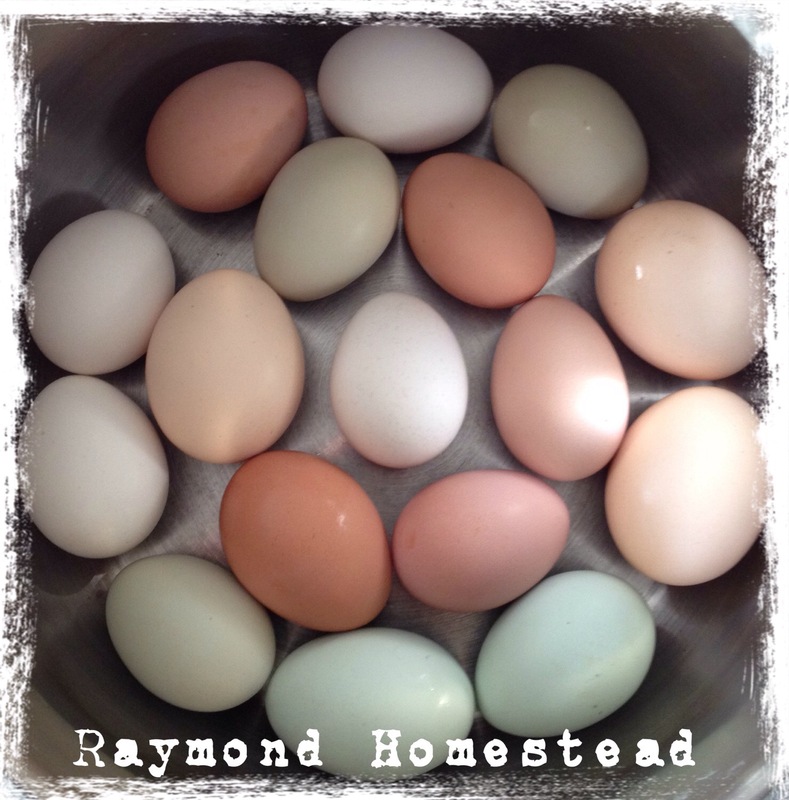 I can’t help but chuckle when people tell me you can’t hard boil fresh eggs. I’ve never had an issue with hard boiling eggs. That might be because I was taught by my mom, who was taught by her mom, who….well, you get the idea. The point is that I didn’t learn how to boil eggs from a cook book but from family teaching one generation after the next, meaning I was taught how to boil fresh eggs without realizing it, where as recipe books teach how to boil store bought eggs that are at least a month old. 1. This might seem a bit obvious, but make sure you look over and clean the eggs that you need to. 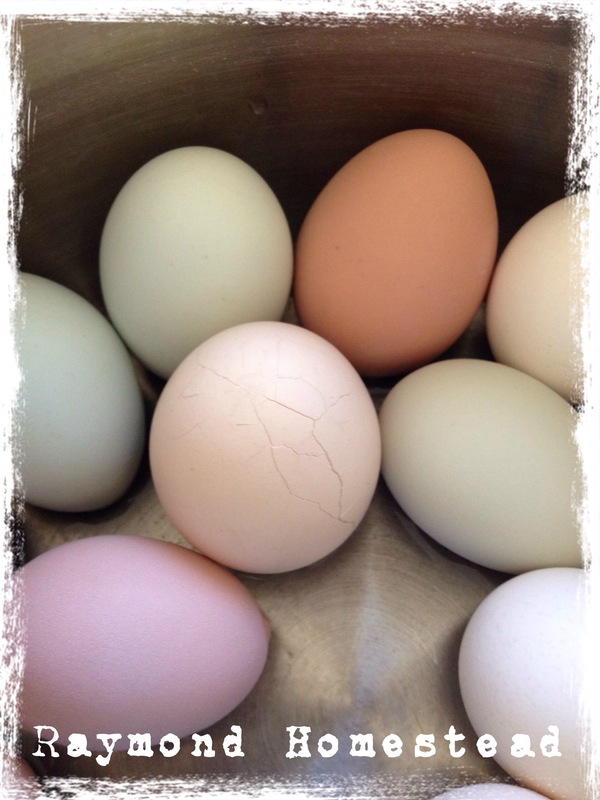 Farm fresh eggs may have some chicken poop or shavings attached. It’s completely normal, but you don’t really want to be eating that. 2. Line the bottom of whatever pan you’re using with eggs and then fill two inches above the eggs with cold water. The water level is important. 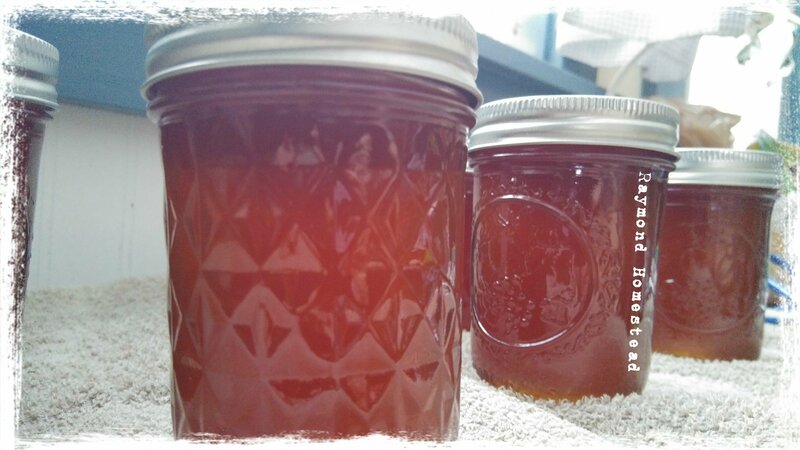 You’ll be boiling your eggs for a while and don’t want to have your pot run dry. 4. Once the water is at a rip-roarin’ boil, put the timer on for 10-15 minutes. Now WALK AWAY but stay in earshot of the timer. Yes, you keep the burner on high. Yes, I said 10-15 minutes. 5. When the timer goes off, check them. How do you know if their done? You’ll have one or two eggs with cracked shells. That’s your signal. 6. Drain the pot or move the eggs to another non-plastic container. The eggs are still hot and have the potential to melt plastic. 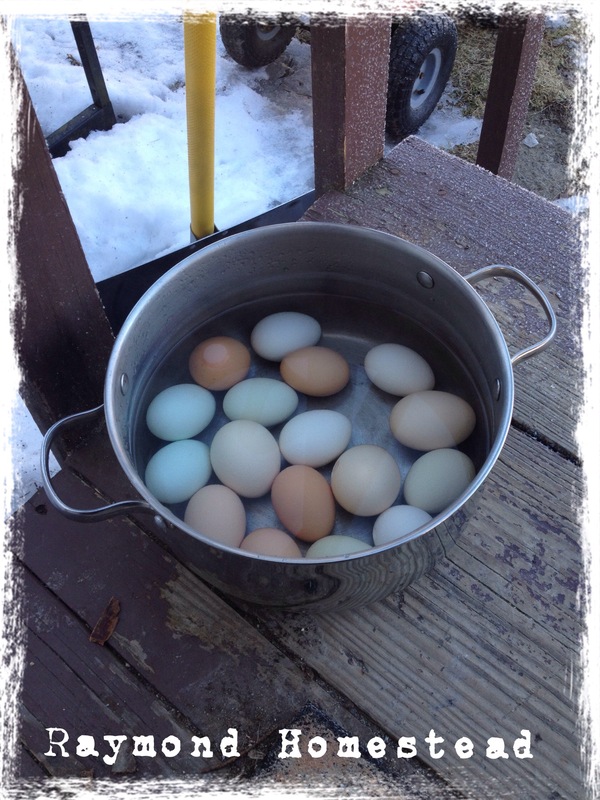 Fill the container with enough cold water to cover the eggs. To shell the eggs, I suggest using a spoon or other implement (I use my wedding ring) to tap around the shell until you find a spot where the shell easily cracks inward. That’s where an air pocket stationed itself while the eggs boiled. If you start shelling from this point, things go easier than if you randomly pick a spot. Another trick I’ve heard, but have never tried, is to add a teaspoon of baking soda to the water. Enjoy those eggs and let me know how things work out! One of the many things that about 99.99% of my generation has no idea how to do is joint chicken. Granted, we’re also the same generation that has no idea that you can actually grow your own food…in your own yard…in dirt. So I suppose it should be no surprise that we don’t know how to joint chicken. I took a stab at it today. I owe a wonderful first time experience to Gordon Ramsey’s YouTube how-to. While I had a hard time party gout the breasts, eventually giving up and just deboning the meat, I was planning on making nuggets anyway. Here’s hoping next time goes even smoother. Fiddlehead season in Maine has come, and pretty much gone. With our first collection this year we decided to try something different. With some home made pasta, ricotta cheese from Crooked Face Creamery, and fresh fiddleheads, we spent an afternoon making homemade fiddlehead ravioli. This is a great started base that you can add any type of seasoning too, along with making it out of any flour. We used wheat flour and an Italian seasoning mix that I keep made up in the cabinet – it’s a lot quicker than pulling out all the individual spices. 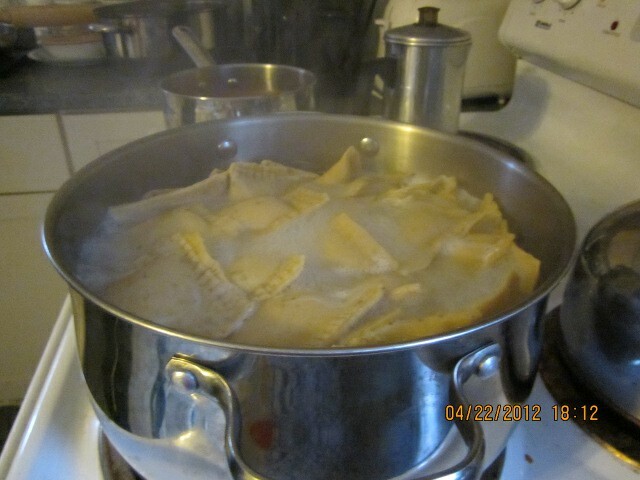 The longest part of it all was rolling out the pasta to cut up for the ravioli. We’ve definitely decided that we’re going to keep our eyes out for a cheap, used pasta machine. As great as homemade pasta is, we don’t really have the time (and I don’t have the upper body strength) to do all that rolling in one afternoon! 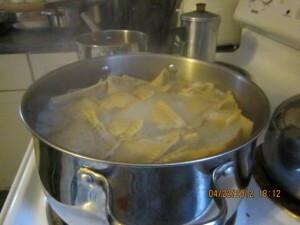 The grand thing about homemade pasta is that it only takes a few minutes to cook. After two hours of manual labor it was great to see the pot brimming with a good deal of pasta. Unfortunately last year’s tomato harvest was a bust due to hornworms and blight. Instead of homemade sauce we’ve been making due with Newman’s Own, a great sauce selection from a wonderful company. With left over filling and sauce to top off the pasta, it looked like a culinary master piece. It was delicious! Everything came out wonderful…but with one draw back. Apparently some people have issues dealing with digesting raw and undercooked fiddleheads. The patriarch of this household seems to be one of those. Given how horrible Joe felt after eating the ravioli with the uncooked fiddleheads in the filling, we decided the next night to chop it all up, mix it with the sauce, and cook it off as a pasta bake. The result? No illness and a delicious pasta bake that we would never had been able to afford in a restaurant. All in all, everything worked out great and we ended up with a total of six meals out of one afternoon of work.